Gunilla Asher's husband, Mark, listens to one of the speakers during the celebration of Asher's life. 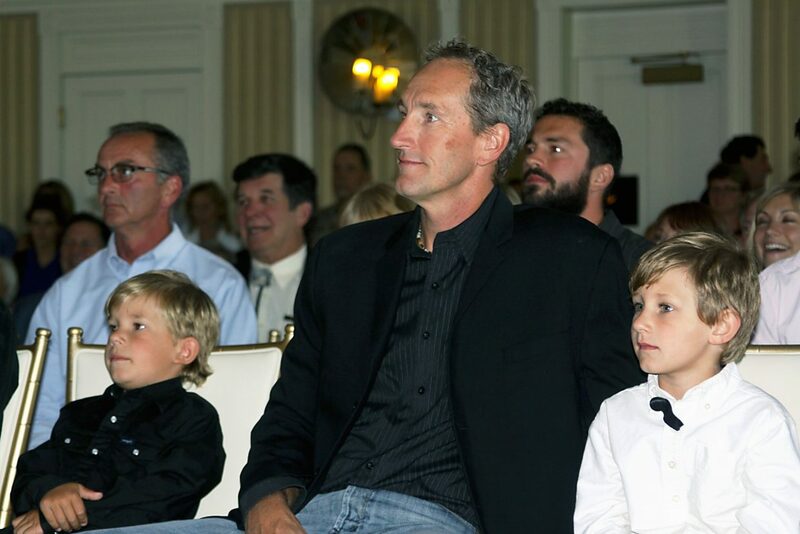 The couple had two sons, Charlie on the left and David on the right. The ballroom at the Hotel Jerome was a flood of laughter and tears as the life of Gunilla Asher was celebrated Friday night. Asher, 42, was the publisher of the Aspen Times who passed away Monday from the cancer that invaded her body. Asher was known for her charismatic personality, million-dollar smile and a determination to make good things happen for her friends and family. She was the wife of Mark Asher and the couple had two sons, Charlie and David. The celebration of Asher’s life was filled with fun stories and pictures of a woman who embraced life and lived it to the fullest. During the standing-room-only celebration, Jim Morgan, the general manager of Colorado Mountain News Media, and two personal friends, Sarah Prell and Pete Ferrara, spoke about Asher. There was a similar theme that rang from all three speakers: Asher lived life to the fullest and always put a smile on the faces of those around her. She was loud, confident, and a little crazy with a lot of love and compassion for those around her. At one point, Morgan related Asher’s tomato preserves to Gunilla herself. Prell related how she met Asher in Oregon many years ago and how the two became best of friends. Every story Prell told about Asher spoke about a woman who embraced life in every aspect and lived to laugh. Not just chuckle, but laugh until tears of joy were flowing. Ferrara met Asher at Fort Lewis College in Durango and became close friends with her and her family. He spoke about his admiration and love of the Asher family. After the three speakers finished, a fifteen-minute video montage of Asher was presented with the song, “Life is Better With You,” by Michael Franti. The pictures encompassed her life from growing up in Snowmass to her final days at the Aspen Valley Hospital, where Asher passed away. The one common thread for all the pictures was Asher’s ever-present smile and piercing brown eyes, the type of features that have made people smile with her all her life. It truly was a celebration as most of the tears shed were tears of joy. Ferrara summed up the celebration best when he spoke of how Asher would want her friends to celebrate her passing, rather than wallow in the loss of someone who lived life to the fullest.